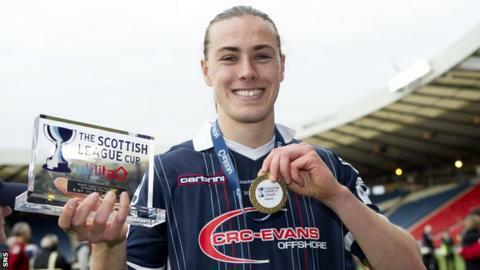 Ross County's Australian midfielder Jackson Irvine says joining the Dingwall club after leaving Celtic has been a big step in his development. Irvine has added the Premiership player of the month award for March to his recent League Cup winner's medal. He was man of the match as County earned their first major trophy in last month's 2-1 League Cup final over Hibs. He initially joined County on loan from Celtic in 2014 and signed a two-year deal with the Highlanders last year. "It's obviously really nice to win individual plaudits and coming with the month we had winning the Cup final, it's been amazing," Irvine told BBC Scotland. "It's pretty special the turnaround we've had in the last year from fighting relegation to lifting trophies and winning awards. "I've come such a long way and I've got everyone at the club to thank. Individual awards only come as a result of you playing in a team and my team mates have been spectacular this season." Irvine says playing at County has been "pretty fantastic"
Irvine believes playing regular first-team football in his natural midfield position has enabled him to progress under manager Jim McIntyre. "This club's been pretty fantastic for me," he said. "Playing games at this age is so important and the manager's stuck with me and has always had faith in me, playing me in my natural position as well. It's been a really big step for my development." With silverware already in the trophy cabinet, attention turns to one last tilt at earning what was the primary objective at the start of the season, a place in the top six. "Unfortunately it's out of our hands now in terms of finishing in the top six," Irvine continued. "All we can do is go out on Saturday and get the best result we can against Partick Thistle and hope that results go our way. "It's frustrating, sitting in fourth or fifth for the majority of the season. That's football. The league's been so tight throughout this whole season. Hopefully a win on Saturday will be enough. "It's frustrating if we don't manage it but it's not over yet and we'll assess that again after the weekend when we find out which half of the table we're in."